Khufu's greatest achievement was the creation of a monument that was to be recognized as the first of the Seven Wonders of the Ancient World, and the only one now standing: the Great Pyramid on the Giza plateau. Originally 481 ft or 146.6 m high (now only 451 ft or 137.5 m, having lost its top 30 ft) it was until the 19th century AD the tallest man-made building in the world - a proud record held by an ancient Egyptian architect for four and a half thousand years. It is not known why Khufu should have turned away from the site of his father's burial at Dahshur, or indeed that of his predecessors at Saqqara. Suffice it to say that he did, and that he chose a stretch on the Giza plateau to the south-west of modern Cairo. His work appears to have been the first on the site and it is curious that he did not choose the highest point of the plateau for his pyramid. This area was taken by his successor but one, Khafre (Chephren), and was to produce the optical illusion that his pyramid is therefore taller than Khufu's, which it is not (p. 45). Khufu channelled all his efforts into the creation of a single monument, rather than several different pyramids. 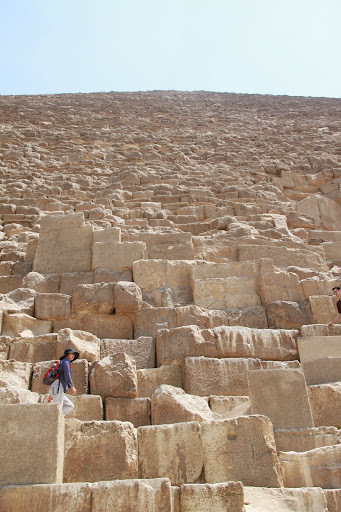 Like its predecessors, the Great Pyramid underwent several changes in its internal arrangements, but its external structure and dimensions appear to have been set from the start. 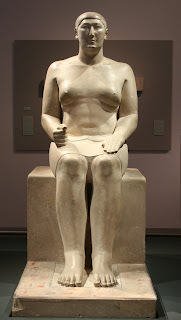 The chief of works is thought to have been Khufu's cousin Hemon, of whom a powerful seated statue was discovered in his mastaba tomb close by his masterpiece. For all its magnificence the Great Pyramid is still a puzzle. Herodotus was quoted some apocryphal figures by the priests: it took 10 years to build the causeway from the valley temple to the mortuary temple, 20 years to build the pyramid itself, and the whole cost was in the region of 1600 silver talents (according to an inscription pointed out to him on the side), or just over £5 million/$7.5 million at present scrap silver prices. Moreover, we do not know exactly how it was built. Theories about this vary, from the use of a long ramp stretching out into the desert which was continually lengthened and heightened as the pyramid rose higher, to a ramp that rose as it wound round the pyramid face following each course upwards. Neither is very satisfactory and each is rather impractical in one way or another. Herodotus said that the structure had been built as a series of terraces, raising blocks on all four sides simultaneously with the use of 'contrivances made of short timbers'. This approach was tested with some success by the late Peter Hodges, a master builder, using short lengths of timber with a metal-shod foot, and it is certainly more convincing than the other theories. The internal layout indicates at least two changes in plan during construction. Initially there was to have been a burial chamber deep beneath the surface of the plateau,- this plan was then altered to incorporate instead a small chamber, now erroneously known as the Queen's Chamber (and unfinished), within the pyramid bulk and about 50 ft (15.2 m) above ground level. Exploration in 1993 by a small robot remote-controlled camera up the south 'air' tunnel from the Queen's Chamber has revealed a small door secured by metal bolts. There is no question of access because the door is so tiny, the tunnel being only 8 inches (20.25 cm) square. The results of further investigation are eagerly awaited. The final change was for the construction of the magnificent Grand Gallery, 28 ft (8.5 m) high and closed by a corbelled roof, which led upwards to a horizontal passage that entered the King's Chamber in the heart of the pyramid. Here, at the west end of the chamber, was placed a large granite sarcophagus, cut from a single block of Aswan granite. The sarcophagus must have been put in position before the chamber was roofed by nine flat slabs of granite (each with an average weight of almost 45 tons), because it is about an inch too wide to pass through the entrance to the Ascending Corridor - an early example of 'built-in' furniture. The exterior of the pyramid was cased with shining white Tura limestone, which was laid, as Herodotus rightly said, from the top downwards. This was largely robbed in the Middle Ages to build medieval Cairo. Of the great limestone mortuary temple (171 x 132 ft, 52 x 40 m) that stood before the pyramid's east face, nothing now remains except its black basalt floor. The valley temple that stood at the foot of the pyramid causeway has disappeared under the Arab village, although parts of it were observed in 1991 when new sewerage was being laid. Around the Great Pyramid, principally on the west side, were located the tombs of the courtiers, who hoped to serve their king in death just as they had in’ life. 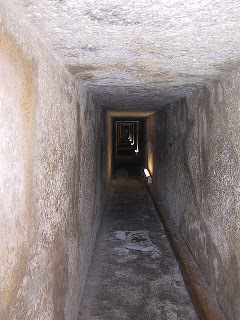 On the east side are three subsidiary pyramids of Khufu's queens. 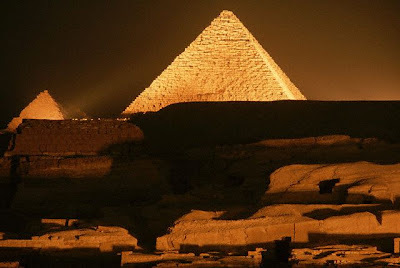 Legend had it, as recounted by Herodotus, that the central pyramid, 150 ft (46 m) square, was a product of the enterprise of one of Khufu's daughters, whom he had placed in a brothel in order to raise more revenue for building the Great Pyramid. In addition to payment, the princess also asked each of her clients for a block of stone, which she used to build her own pyramid. Needless to say, there is no evidence to confirm the story, although the pyramid does appear to be that of a half-sister of Khufu. 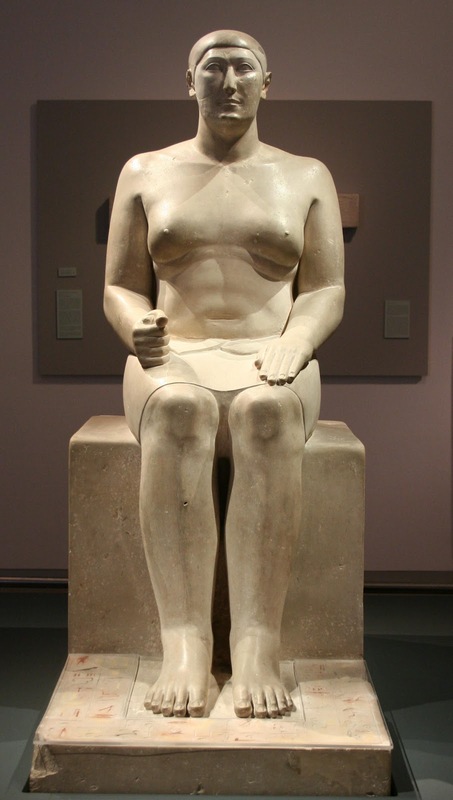 The first pyramid probably belonged to his full sister-wife, and the third to another half-sister, Queen Henutsen. Two remarkable discoveries relating to Khufu have been made in the vicinity of his pyramid: the first, found in 1925 on the east side close to the causeway, was the tomb of his mother, Queen Hetepheres (see box); and the second, uncovered in 1954 close to the south face, was that of an intact wooden ship.